As many businesses are discovering, customer behavior doesn’t always make sense. That really shouldn’t be surprising. As recent studies have shown, people tend to base their decisions on more subconscious, emotional desires than on rational, practical choices. What’s more, customers aren’t able to tell you accurately why they do what they do. 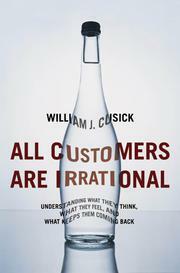 Combining recent research findings with real-world examples from his consulting practice on customer experience, William J. Cusick examines how the subconscious part of the brain drives the decisions and behavior of every customer on a daily basis and introduces the concept of "the irrational customer." All Customers Are Irrational shows why businesses must change their approach to attracting and retaining customers, and proposes ways they can alter their strategies on everything from customer research, product design and website development to call center management, employee recruitment, and retail store layouts, by focusing on what customers are actually doing instead of what they’re saying. Honest, direct and insightful, All Customers Are Irrational will help businesses tap into the impulses and motivations that both attract and retain consumers for the long haul.